With the armory set up, only Jack and Locke know the combination to the door. Charlie relocates away from Claire's tent, and Jack gets into it with Sawyer when he takes his bottle of pills. Sun is out tending her garden when she's attacked by someone that drags her out into the jungle. Sawyer and Kate hear her and find her unconscious. Since the Others agreed to leave them alone if they stayed away, Kate suspects Ana Lucia had Sun attacked to rally support for building an army. Sun wakes up and tells Jack what she remembers. Sawyer heads to the hatch and tells Locke that Jack is on his way over to get the guns. Locke decides to hide the guns out in the jungle so that Jack can't get to them. Jack gets to the hatch and finds all the guns gone. He goes to the beach to confront Locke, but it turns out that Sawyer was playing both of them against each other so that he could take control over the guns. There's a new sheriff in town. Sayid works with the radio that Bernard found in the Dharma station, and he picks up the signal of an old time song. In a bit of foreshadowing, Hurley jokes that the song could be coming from the past, and just arriving to them now. 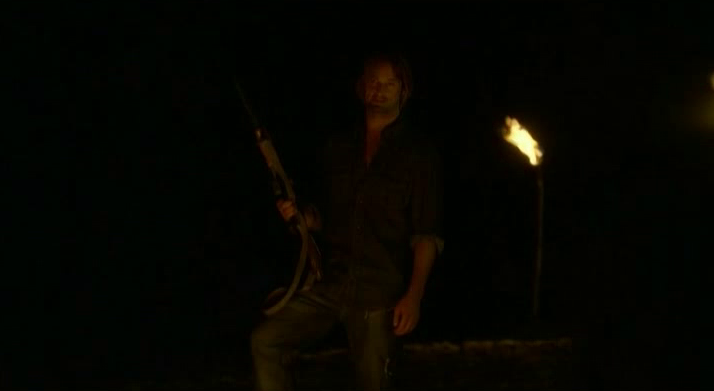 We find out that Sawyer hired Charlie to attack Sun, as it was all part of his plan. Rousseau shows up, and Sayid goes with her, where we see Benjamin Linus captured in one of her nets. Meanwhile Sawyer's having problems with a noisy frog out in the jungle. He goes out there and finds Hurley eating from his secret stash. Sawyer agrees not to tell anyone if Hurley helps him get the frog. Ben claims to be a man named Henry Gale, and Sayid cuts him down. He tries to run away, and Rousseau shoots him in the back with an arrow. Sayid brings him back to the hatch, and Ben tells him his story, that he crashed on the island in a hot air balloon. Jack takes the arrow out, and Sayid wants to interrogate him to find out the truth. Locke changes the combination to the door, they put him in the armory, and Sayid closes the door so that he can get time alone with Ben. Jack finally convinces Locke to open the door, and in doing so almost runs out of time to enter in the numbers, and we see the countdown clock change to some hieroglyphs. Sayid is convinced Ben is an Other, but Jack is not, and we end the episode with Sayid explaining himself to Charlie. The episode runs 60:27 and is 489MB to download. You can stream the episode below (via Facebook), or go here to use torrents (better quality, recommended) to download the episodes to your computer.